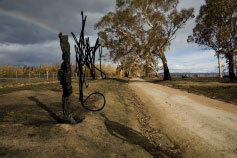 Tony Coleing’s work (pictured), is a finalist in the 2013 Josephine Ulrick and Win Schubert Photography Award. 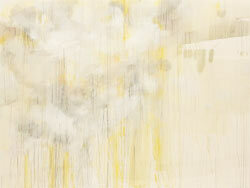 See it at the Gold Coast City Gallery until 19 May 2013. A new limited edition book by Tony Coleing has just arrived in the gallery. Please enquire for more information. 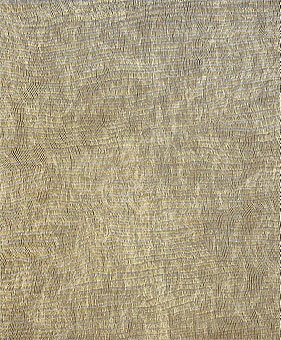 Catch Yukultji Napangati’s highly commended painting in the 2013 Wynne Prize at the Art Gallery of New South Wales until 2 June 2013. 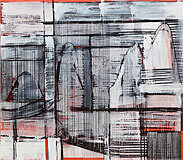 Tony Coleing has been shortlisted for the 2013 Josephine Ulrick and Win Schubert Photography Award. 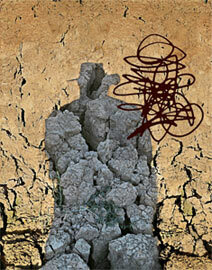 Coleing’s work will be exhibited alongside other finalists at the Gold Coast City Gallery from 6 April to 19 May 2013. The pair tied the knot at St Andrews Anglican Church in Braidwood on Saturday 9 March. Congratulations! Art Month events - not to miss! The Salon: The catalogue for our latest exhibition, which begins Utopia Art Sydney’s 25 year celebrations, is now available to view online. Grab a copy of the current Artist Profile (issue 22, 2013), to read Anne Sanders’ excellent interview with Christopher Hodges. 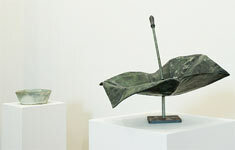 Marea Gazzard’s ceramic sculpture Torso 1 of 1967 is included in ‘The mind’s eye’, an exhibition of works from the Art Gallery of South Australia’s collection. Online catalogue now live, with with installation shots and press clippings from the touring exhibition, curated by Sandra McMahon. Angus Nivison fans can also look forward to his solo exhibition at Utopia Art Sydney, which will open on Saturday 6 April – save the date! 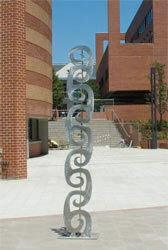 ‘Curl Curl’ looks fabulous at the entrance to the University of Western Sydney’s Parramatta Campus. It was installed last week. Don’t miss this unique exhibition, which may just be for the birds. Last day: Saturday 23 February. Image: View the online catalogue. Our next exhibition squeezes twenty five years of Utopia Art Sydney history and as many artists in a salon hang, with floor to ceiling art. 2 – 30 March. Christopher Hodges and Jane Raffan will discuss collecting Aboriginal art with a hands-on guide in the gallery stockroom. Saturday 16 March, 2 – 5pm. Join R. Ian Lloyd, photographer of Studio: Australian Painters on the Nature of Creativity, for a Q&A session with Angus Nivison on the challenges of being a regional-based artist and the luxury of enjoying a large studio space. 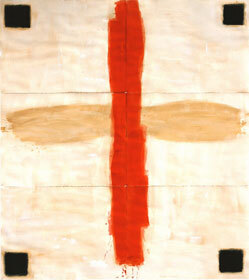 Angus Nivison in conversation with Christopher Hodges. our first exhibition of the year, opened with a bang last night, but all you lucky people still on holidays can catch it until 23 February. The catalogue is online now. 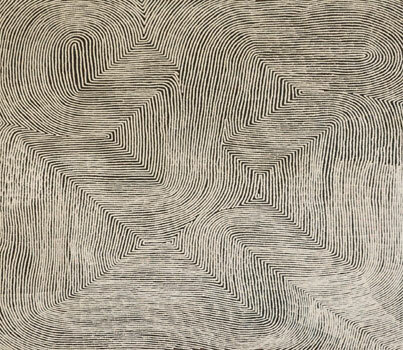 We are pleased to announce that Angus Nivison has been selected for the Dobell Prize for Drawing, 2012 at the Art Gallery of New South Wales, until 10 February, 2013. 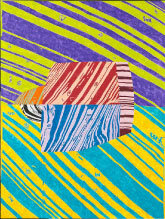 Liz Coats has completed her doctoral work at the Australian National University on ‘Organic Growth and Form in Abstract Painting.’ Well done Liz! Helen Eager’s wall painting Tango, commissioned for the opening of the MCA, features in the Sydney Magazine today. Visit the gallery on Saturday, November 10 at 3pm to hear Bryan Hooper discuss John R Walker’s latest body of work – until November 17. John Bursill’s ‘In Landscape: Drought, Fire & Flood’ will be opened by Frank McGuire MP at Queens Hall, Parliament House Victoria on Tuesday 13 November at 6.30pm. From November 12 – 16 , 2012. 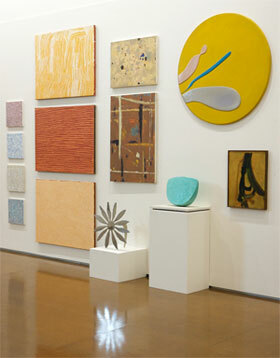 Angus Nivison: A Survey opened at The University Gallery, The University of Newcastle on Saturday October 24. The exhibition will be in Newcastle until November 10. The next stop of Tamworth Regional Gallery’s touring exhibition is the S H Ervin Gallery Sydney, from January 5 – February 10, 2013. We are pleased to announce that the first of Peter Maloney’s most recent series of vibrant paintings is to be part of Artbank’s collection. This news bodes well for Maloney’s show at the gallery next year! ‘John Bursill - Shadow Maker’, a preview essay by Geoff Wallis, can be found in the current, fifth anniversary issue of Artist Profile.